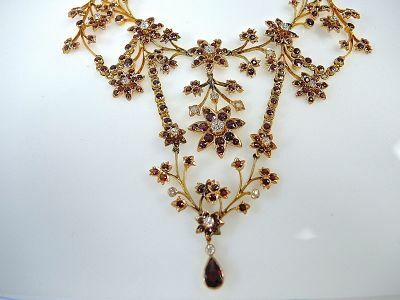 One 14 karat yellow gold floral lavalier with one (1) pear facetted garnet (0.88 carats). 283 facetted garnets (24.93 carats). Twenty-five (25) old European cut diamonds (1.78 carats: VS-SI clairty: G-H-I colour). The necklace is 16'' in length and is accompanied by a brown fitted leather box signed 'A.E. Halfhide Diamond Merchant & Silversmith Hill Rd Wimbledon."